This paper promotes the involvement of spatial information as an important contribution to decision making as an integrated process within a multidisciplinary network. Geoinformation (GI) is not any more a single tool of a small community of Surveyors and Geographers focusing on Spatial Information Management. GI has crossed the gap between individuals and enterprises, but there are still some shortcomings in using spatial information. In the first part of the paper objectives of information management as a contribution to sustainable development will be reviewed and the indices for characterizing resources of a society will be identified. In a second step the state of the art Spatial Information Management will be described by examples. Finally the paper focuses on the impact on and benefit for society and the surveying professions of increased use of spatial information. Usually people in a society are not aware of slow spatial changes over a longer period of time and thus tools for managing spatial and temporal information are needed. But how can those relevant spatial components be defined and how can they be used to optimize the use of resources by a society? Traditional mechanism for optimizing resources may help to understand potentials for optimizing the benefit for a society using temporal information. A society as a compound of interrelated individuals agrees – driven by traditional concepts - on value systems and the use of resources to achieve defined aims for the majority of individuals. In general the use of the various resources is first of all a decision of the society dependent on its value system. Spatial information and GI tools are suitable means to optimise the sustainable use of resources within a given framework. Societies with various and diverse value systems are unavoidable under higher social pressure. An example (Thurston, 2003) may clarify this: It is an unspoken rewarding system in the western society that (i) headwork is better rewarded than handwork; (ii) financial skills are better rewarded than technical competences; (iii) management talents are better rewarded than financial skills. Those societies with a rewarding system in conformity with their main sources of wealth and prosperity have a tool for optimizing their resources which also serve as a shield against poverty. There are obviously mechanisms which facilitate the optimizing processes in a society to improve an infrastructure. Can we derive from the general decision making mechanisms of a society the processes for improved use of resources related to spatial infrastructure? The general public is not much interested in technical issues and the consequences of decision making seem be clouded in mystery. Actually, there are some mysteries that De Soto brings to light. The first mystery is the "lack of information." The poorest people in the Third World do not know that they are sitting on valuable material assets. Secondly the "mystery of capital" itself: Capitalism is what a legal, property/contract system allows people to create values based on their material assets. The third mystery is the lack of "political awareness" of changes: In recent decades, people all over the world moved to cities - a migration with implications of revolutionary proportions that have been virtually ignored. The fourth is the “mystery of forgetfulness” - the "missing lessons learned from history." People in rich countries don’t even recall how their legalized property system came into existence. Finally, the "mystery of legal failure"— why property law does not work everywhere: Third World Countries cannot just transfer the western legal system without linking it to their own traditions of values. Doing so is an obstacle for creating values out of assets. Human and natural resources are usually finite. Sustainable development provides a framework under which communities can use available resources efficiently, create efficient infrastructures, protect and enhance quality of life, and create new businesses to strengthen their economies. In the field of Geoinformatics training currently several policy initiatives transcend current education strategies. New job description will come up with specifications like: Spatial Information Officer, Information Cartographer, Metadata Specialist (Thurston, 2003). Surveying appears to have lower public esteem than Geoinformatics. “I'd like to think training needs are being driven by the marketplace," says Kelly, Managing director of ANZLIC. Networks of universities like UNIGIS provide a service as a global, virtual & multilingual university for Geosciences, also working together in research and curriculum development activities related to GIS education. Students registered in a UNIGIS programme may qualify for the EuroMasterGI, a European post-graduate qualification in Geographic Information. On the other side there is simply a lack of interest amongst the student community in surveying careers. A sound information infrastructure needs more than data. There is urgent demand for harmonization of services and data for optimised common use. There is no direct contact any more among creator, provider and user of spatial data. Therefore data need not only standardized geo-referencing in order to provide a clear link to administrative units, addresses or other specific geographic units. There is an increasing demand for metadata on spatial information. Librarians have been producing and standardizing metadata for centuries. The spatial information managers have to do the same for easier access to all the spatial information created. The driving force behind economic development depends on the focus of a society. In Europe the transformation from an industrial to an information society became obvious during the recent thirty years. The industrial society needed access to steel and coal - both together were forming the bases for industrial development. The European Coal and Steel Community (ECSC) of 1952 was an essential root of the European Union and expressing herewith the industrial background. Nowadays in our information society people are often not yet aware of the new demands on infrastructure, when changing their main source of income from producing industrial goods to a service oriented “knowledge economy” based on information and communication technology (ICT). Data and ICT are the driving forces behind an information society. So it doesn’t surprise that at the end of the 20th century the focus was on digitising data and on building infrastructures for accessing these data. The next wave might come from integrated services as driving force behind our society. According to the Kondratieff Cycle (Nefiodoff, 2001 and Alexander, 2002) the next wave will focus on the ability to cooperate, which seems to become the key qualification for increasing productivity. This means: Information becomes interrelated. The Kondratieff Cycle is a theory based on a study of nineteenth century price behaviour in the US. 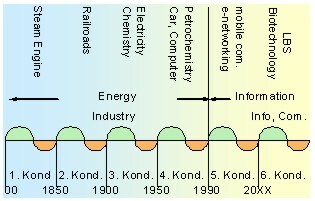 Kondratieff observed certain characteristics about the growth and contradictory phase within long-term periods (which averages 54 years in length). It can be concluded that there is a systematic structure behind periodically behaviour of economy. Good decisions are based on good information. Good information is based on good data. Planning, shaping and modelling of proposed plans are parts of information management which became a fully digital process. The demand for spatial information for decision-making can be considered from different perspectives. First and foremost, the process of decision-making requires information as an input (informed decisions). Secondly spatial information is needed for impact analysis. As is well known, decisions have a range of immediate up to long term impacts. In all cases, the consequences of decisions must be predicted and controlled. Especially development processes require monitoring and evaluation of the decision’s outcome. This is the reason why the increased need for spatial information is becoming a challenge for people who are involved in decision making with spatial components. Data collection and data analysis have contributed to an improved understanding of social and environmental impacts on planning and development actions. With new surveying, communication and information technologies decision-makers have more spatial information and thus accountability on the interrelationship of communities, impacts and effects of decisions. Finally the decision-makers have a powerful instrument for future developments. It is not just about the availability of information but we also need links as a bridge from existing knowledge to new information. Information exchange as a process enables humans to share and acquire knowledge from others. Information technologies (IT), developed to support information processes, are still designed to operate within established structures of closed systems. In order to overcome the barriers of closed communication cycles and to grant wider access to knowledge, it is not sufficient to deliver data. There is a demand for information entities containing indicators for potential common interests, values, interpretation patterns including rules for intended goals. New knowledge can only be achieved when incoming information can be linked to existing knowledge. Therefore a different view on information results in a different knowledge, which also depends on existing knowledge. Spatial Information services have to consider the users perception. In business world surrogates are often used because we have no access to the original. The ownership title is such a wildcard. Information as a wildcard allows us to model a “virtual world” for orientation and decision-making. Thus information allows a remote observation of space and time in a way we could not do otherwise – like environmental scenarios. What kind of information infrastructure is needed to let these mechanisms work? The recent introduction of the Euro increased the awareness for the demand of integration of individual, fragmented markets into a joint European one. Some of the lessons learnt may also be helpful in a knowledge-based economy for introducing information as a surrogate (of given values) for facts proved or collected. This applies for the land market and the ensured information on property in the same way as for spatial information in general. Decisions are made at different administrative or organisational levels. Nowadays, there is a global tendency to decentralize decision-making and delegate responsibility to regional or local authorities or organizational units. As a result, the number of points where decisions are made has been increasing and this leads, among other things, to a greater need to share geoinformation. Modern governance requires transparency and the involvement of communities and citizens in the decision making process. Decentralisation and community empowerment are strategies to achieve transparency and participatory democracy. This also applies for community based land management processes in particular and development administration in general. Modern spatial information management tools facilitate decentralisation, community empowerment, and citizen participation, which guarantee social cohesion and sense of belongingness. The legal system, especially the property laws of a country reflect the rather sustainable concept in people’s minds. In Europe most of the land administration systems were created for tax purposes and have their roots in an agricultural society. a legal framework established to secure the Intellectual Property Rights are an essential component of an information market. Market distortions deriving from a high percentage of misuses – like in music and software industry - would have a negative impact on use and trust in spatial information. Data Protection legislation protects individuals against abuse of information based on an understanding of the national security issues, but has an impact on access to information. The Bathurst Declaration on Land Administration for Sustainable Development (Bathurst, 1999) calls for a commitment to provide effective legal security of tenure and access to property. It identifies the need for the promotion of institutional reforms to facilitate sustainable development and for investing in the necessary land administration infrastructure. It recommends the active participation by local communities in formulating and implementing the reforms, and it sees an increasingly important role for IT in developing the necessary infrastructure and in providing effective citizen access to it. The market value of land is no longer derived from agricultural benefit, but increasingly interesting for industrial use, for urbanization and as a resource for transport systems. All of them offer higher prices than the agricultural land market. The land market became distorted – rules for use (land use planning) have been developed. Even in a post industrial society real property rights are one of the cornerstones for the land market - a driving force for economic development based on four pillars. 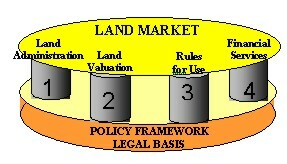 Figure: Four pillar-model of the Land Market - based on three pillar model of (Dale, 1999). There is a global trend of migration from rural to urban areas because urban environment seems to offer better jobs, income and infrastructure. The urban-rural conflict becomes visible in the slums and suburbs. More and more rural resources are used for urbanization: human resources as well as land are used for urban development. Human resources become a main part of urban economy. On one side the “brain-drain” is a hindrance for rural development – on the other side the rural regions serve as buffer for economic fluctuation as long as there is a rural infrastructure to which people can come back. The United Nations estimate that by 2025 54% of the world’s 7.8 billion population will be living in urban areas. The percentage is higher in the developing countries which also results in a breakdown of the transport system. “We have to change the way we move ourselves if we are to avoid the gridlock of environmental degradation brought out by transport” said Kurt Hoffman, director of the London-based Shell Foundation. Statistical data point out rural areas as multidimensional reserves for human resources that are needed for urban development. Human resources and human knowledge are some of the most important resources for sustainable development all over the globe but especially in high-industrialised countries. The globalisation of economy and the complexity of global ecology need experts. The high-industrialised countries have met this need within the last decades and consulting services, education and training became substantial export articles to developing countries. Land serves as living environment and as a base to fulfil the various human needs with three main functions (Banko & Mansberger, 2001): (i) economic, (ii) social and (iii) ecological functions, whereas the priority setting of functions characterises a society. Beside capital and labour land is one of the classical production factors of an economy. It can be seen as a product itself or as a mean for producing other goods. The land market has some specifics: Firstly, the supply of land is constant within a region. The concept of the free-market system that supply of goods (land) can be increased works only for some branches of the land market - e.g. the supply of building land can be increased by modification of zoning. Secondly, land is not a homogeneous product: Parcels differ e.g. in regional sites, in the degree of existing infrastructure, in soil quality. So each parcel is not fully substitutable. Land and water are a basic necessity for the food industry, for energy resources (e.g. oil, coal, water) and for the cultivation of renewable resources (e.g. wood). All non-economic benefits for human beings from land can be summarized as social resources of land. These aspects include the function of land to regulate the climate and the water supply as well as the purification of air and water. Land often has an emotional component for its residents. The region of birth often is seen as homeland. Many military conflicts were justified by claims for the same region by different nations. But land also is an inspiration medium for artists. The beauty or the specific landscape of a region often are the catalyst for the composition of paintings, poems or music. The function to reduce noise emissions becomes increasing important in densely populated areas or areas with a high rate of traffic. Considering the protective function for human beings, land plays a schizophrenic role: Besides of the climate conditions, the specific topography of land is the reason for most natural disasters, e.g. avalanches, floods or landslides. On the other hand land can protect people from natural risks – once again due to its specific topography. Thus information about land becomes an important part of modelling and planning within the frame of disaster risk management. The following example clarifies the potential role of spatial information within disaster risk management: The Government of India and UNDP started a joint Natural Disaster Risk Management Programme under which a database for disaster risk management and sustainable recovery is built. The ecological function of land in terms of climatic change and conservation of natural resources and biodiversity has received increasing attention by the international community (UN 1992; UNFCCC 1992, 1998). International agreements address the requirements for the functioning of ecosystems. As a consequence of that many worldwide and national initiatives focus on awareness of biological and diversity issues. Landscape is recognised as a unique mosaic of biotic and abiotic features (for example: cultural, natural or geomorphologic features). It is recognised that the change in land use practices is important factors for both biodiversity and diversity of landscapes, which again asks for modelling tools of spatial information. Looking back at the history of Spatial Information Management shows the progress made and better explains the current challenges as well as next steps to be taken. Thirty years ago we learned about GIS. We focused on implementing and tuning a stand-alone tool - a unique GIS-package adapted to the internal needs of a company. We were happy to ride the horse and accepted frictions caused in our production processes. Twenty years ago we were focusing on digitizing data – everything had to become digital. We stuffed our information into bits and bytes. Everybody did it his own way, which turned out to be a hindrance for data exchange. Ten years ago we realized that we did similar things and needed to share data. We realized that frictions in sharing information are not only caused by data, but also by institutional settings. Nowadays we try to improve our institutional setting by cooperation – some even by merging organizational unit, but there is always an additional organization to cope with – so cooperation is needed anyway. As a result from that a lot of effort are necessary for standardization (ISO-TC211, OGC and within all the GIS-companies, GSDI, EU-INSPIRE), but still there are frictions. Within the last decade a lot of changes have took place in the field of data collection, data processing and equipment (GPS, laser-scanning, digital imaging and image processing). The development was mainly technology driven. Thirty years ago surveying equipment got an innovative push by the computer technology. The competition on new technologies led to the merging of companies and partnerships between companies. At the beginning of this process companies of similar profiles merged (like Wild and Kern). Later on companies of rather different backgrounds also merged. Surveying equipment met software (Leica, Helava, System9). Nowadays cooperation is seen under a wider perspective (e.g. Partners of Leica) and goes beyond the approach to integrate software into some hardware (surveying equipment). It seems that the business models changed. The change from supply to demand driven developments, products and services requires the involvement of heterogeneous expertise. Therefore a flexible cooperation can bring more benefit than just merging companies, which caused many frictions. The next step of this business approach resulted in combining tools used in that process e.g. : “Total Management Systems for Real Estate” with GIS (e.g. : SAP and ESRI). Technology empowered individuals and local communities to create their own IT-solutions with integrated tools for spatial information management. While the amount of digital spatial data collected at the local government level is dramatically increasing, but little is incorporated in the public domain. This development might still be rather an opportunity than a threat. One day all these data can contribute to aggregated information as a result of an integrated, well coordinated approach to spatial information. In the past technical development of equipment resulted in a faster and more cost-efficient data production. In the next step improvements focused on optimised production processes within individual companies. In the meantime organizational improvements can be obtained by streamlining procedures as inter-institutional “Clustering” processes. The increased financial pressure on public institutions as well as on the private sector forced the process of rethinking their business models. Duplication of work is not affordable any more. All kind of outsourcing became fashionable e.g. acquisition and maintenance of spatial data. Traditions were given up in favour of process oriented cooperation along the chain of added value and led to clustering (www.giscluster.at). Whatever can be provided by somebody else in a more efficient way is preferable to in-house solutions. That situation calls for partnership and teamwork across disciplinary lines, bridging different commercial sectors, which is also an opportunity for local communities: “Paradoxically the lasting competitive advantages of a global economy are increasingly focusing on local conditions – knowledge, partnerships, motivation: components which hardly can be reached by afar rivals” according to [Porter, 1998]. There is a growing number of applications and services utilizing spatial data to provide business solutions in government agencies, business enterprises and the communities such as emergency management, disaster risk management, natural resource management, land administration, environmental monitoring, health, geo-marketing, routing, tourism and finance. FIG-Publ.No. 31: “Land Information Management for Sustainable Development of Cities - Best Practice Guidelines in City-wide Land Information Management” provide specific information and recommendations on that topic. On the global level GSDI is promoting the concept of Global Spatial Data Infrastructure. See also the publication: SDI-cookbook. The EU – Initiative: “INSPIRE” aims at establishing the European Spatial Data Infrastructure (ESDI) by making available geographic information for decision making with a territorial dimension or impact. This infrastructure is intended to deliver spatial information services to its users. European Umbrella Organisation for Geographic Information (EUROGI) is raising awareness of SDI. The Permanent Committee on GIS Infrastructure for Asia and the Pacific (PCGIAP) is developing the Asia and Pacific Spatial Data Infrastructure (APSDI). PCGIAP has made significant progress in establishing a regional geodetic network and has become a model for the Latin American region. Click here for more on NSDI in India. The Permanent Committee on Spatial Data Infrastructure for the Americas (PC IDEA) aims at developing spatial data information capabilities at all levels, also by increased production of spatial data, influencing research and sustainable development. There are also attempts to establish a National Spatial Information Framework (NSIF) in Africa. International Organization for Standardization (ISO) TC-211 aims at establish a structured set of standards for information concerning objects or phenomena that are directly or indirectly associated with a location relative to the Earth. OpenGIS Consortium (OGC) - specifications support interoperable solutions with "geo-enabled" web-tools and location-based services to make complex spatial information and services accessible and useful for other applications. World Wide Web Consortium (W3C) develops interoperable technologies to lead the Web to its full potential. W3C is a forum for information, commerce and communication. UN-HABITAT runs two major worldwide campaigns – the Global Campaign on Urban Governance, and the Global Campaign for Secure Tenure. UN-HABITAT is monitoring global trends and assesses the progress of implementing the Habitat Agenda by two main instruments: Global Urban Observatory and Statistics and Best Practice Database. World Development Indicators 2003: Information and selected samples from the World Bank's premier annual compilation of data about development. Land Policies for Growth and Poverty Reduction: stressing importance of land rights and facilitating land transactions can set in motion a wide range of social and economic benefits including improved governance. The EU-INSPIRE Project is a triggering force for a joint European action on spatial data infrastructure in practice. A coordinated decentralized approach should ensure a flexible solution based on information to be summarised for implementing and monitoring policies of decision-making (regional, national and community). The EU-EULIS project within the eContent-programme aims at establishing a European Land Information Service by accessing national land information across borders via the Internet. In 1999 the EC published a Green Paper on “Public Sector Information”. In 2001 a “White Paper on Governance” announced that all EU-legislation will be accessible for free on the Internet in all the Union languages through the EUR-Lex portal. In 2001 the EC has launched “eEurope 2002: Creating a EU Framework for the Exploitation of Public Sector Information” which focuses on the economic aspects of public sector information. The right to re-use public sector information will support the growth of the European Content Markets similar to the US where the reuse of public sector information has given way to an information market that is up to 5 times the size of the EU market (Spira-Study, 2000). Europe is seeking for a balance between initiating market growth and charging for public sector information on the way to a knowledge economy. The key factor for success seems to be the joint interest of partners involved based on economic factors as driving force for improved services. The vision of the Spatial Information Council for Australia and New Zealand (ANZLIC) is that economic growth, social and environmental interests are underpinned by spatially referenced information. ANZLIC's facilitates easy and cost effective access to spatial data and services provided by a wide range of organisations in the public and private sectors. In the United States the Federal Geographic Data Committee (FGDC) is developing the National Spatial Data Infrastructure (NSDI) in cooperation with organizations from State, local governments, the academic community, and the private sector. 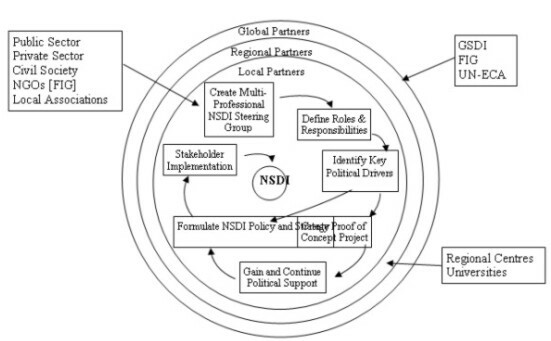 The NSDI encompasses policies, standards, and procedures for organizations to cooperatively produce and share geographic data. The goal of this Infrastructure is to reduce duplication of effort among agencies, improve quality and reduce costs related to geographic information. In Canada GeoConnections a national partnership initiative is working to build the Canadian Geospatial Data Infrastructure (CGDI), which will make Canada's geospatial databases, tools and services readily accessible on-line. “The GeoData Alliance (www.geoall.net/) is an innovative, non-profit organization open to all individuals and institutions committed to foster processes to enable the creation, effective flow, and beneficial use of geographic information. In Austria the GIScluster (www.giscluster.at) is a fusion of companies that offer a broad selection of know-how and services along the chain of added value. This interdisciplinary cooperation within the business of ‘spatial data management’ includes acquisition, management and the visualisation of data. The ‘Three Ordnance Surveys’ of Great Britain, Ireland and Northern Ireland cooperate on building and maintaining national databases [Murray et al., 2001]. They intend in the long run standardisation of data, structures, identifiers and formats. The Austrian software company Progis (www.progis.com) is applying new approaches to ‘Precise Agriculture’. Their decentralized approach of shaping the business procedures supports the dataflow between farmers and the regional agricultural administration centers to be used also for updating. Updating has to involve the farmer, who knows about the actual changes in the field. An other good example for an integrated approach comes from Canada: The “Land and Water British Columbia Inc.” under the “Ministry of Sustainable Resource Management” is responsible for land issues but also for Water Licensing, Water Use Planning, Water Resource Information. New tools and methods for learning came on the market during the last years to support knowledge transfer and to enable virtual lecture rooms. Will that change the whole educational systems? Can they substitute traditional lecturing or replace the teachers? Questions that cannot be answered yet, as the access to electronic media is the limiting factor for this new technology at the moment: 50% of the population of North America are able to surf in the Internet, whereas only approximately five percent population have access to Internet. But there is no doubt that e-Learning brings about new opportunities for knowledge transfer – also in terms of life long learning. The use of spatial information technologies is providing substantial economic, legal and political advantages. Possession of spatial information has also contributed to military power. We need to reflect on the potential significance of technological and institutional changes for the widening or lessening of social and economic gaps in society. Traditionally intellectual and emotional engagement is attached to a certain location. These place-based communities are increasingly being complemented by virtual ones where people ‘meet’ and become involved with others without regard to distances. The risk that Internet accelerates the detachment of individuals from the places within which social networks are formed is balanced with the opportunity to interact with self-defined communities electronically in response to exclusion from local communities. As people transfer more of their time and loyalty from actual to virtual communities, the balance between place-based and non-place based communities is shifting, with potentially wide-ranging implications both for places and communities, and for the influence of place on individuals (Goodchild et al., 1999, - Varenius-Project). This development might be a disadvantage for the communities in rural areas. to create and maintain data models and databases from which information can be extracted, processed and shared by many stakeholders at any given time. How can we deliver the right information to the right people at the right time, if the right information must be derived from here-and-now parameters that change daily? The answer comes from business model innovation. In other words: the result of human activities on different locations is an integral part of information required and should be considered as part of our modelling processes. Finally the role of the surveyors will not stay untouched by the modern information management including data acquisition methods and distribution technologies for streamlining inter-organizational workflows. Surveyors have to develop from pure data collectors to information managers. Reorganization takes time and resources – during that time customer contacts are weakened. The renewed organization may again not fit because the business world is changing constantly. Even running the traditional “change script” faster does not work. The reaction to increased business pressure with organizational changes often is the wrong way. The most dynamic firms shift business models without organizational changes. Instead of shifting organizational blocks we have to shift mindsets!!!! Fig. 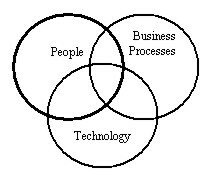 Integration of processes. Some decades ago the strong position of surveyors with almost a monopoly in geometric data acquisition was mainly based on technology and people - technological innovation combined with highly skilled experts. In the meantime technology became cheaper and easier in its use. This led to a wider user community: thematic experts acquire geodata themselves. This trend was increased by another change: Geodata became more detailed in their “thematic resolution”. The required knowledge for geodata assessment shifted from geometric to thematic issues with the consequence that thematic experts are more involved in data acquisition than surveying experts. Expert for integrating business data, thematic data and geodata across different professions to generate “geoinformation for decision making”. Or with other words: the surveyors have to mutate from “Geodata Collectors” to “Managers in Geodata Clusters”. The training and communication of these skills and the understanding of demands and language of other professions will be essential for the success as a surveyor. Surveyors, who contribute to the consulting business, experience already today the wide range of skills and inter-professional cooperation needed. The interval for launching new products will increase and business models have to be adapted to the faster and more automated sampling of geodata. The trend to lower costs for surveying and data capturing will continue. Due to the broad thematic orientation and huge amount of geodata needed for a wide spread field of users the organisation of data acquisition requires new strategies. Co-operations and partnerships of companies and/or institutions on a local or regional level (Public/Private Partnerships) in so-called “Geodata Clusters” could be the key development. “Geodata Clusters” will need a core group for the managing of geodata: Surveyors with their education and knowledge of geodata management have to take this position: Providing service for our customers and bridging contributions from different professions. From that point of view I wonder how long it will take national surveying associations to open up their communication to other professions e.g. by organizing cooperations for developing a better service to the customers. Decision-making for improved use of limited resources is highly related to spatial information. Especially the basics of geoinformation (links between men and land) should be maintained countrywide to enable and guarantee unobstructed common and personal welfare. Good Governance requires affordable integrated solutions for access and use of geodata for an increasing number of users. New Technologies opens opportunities to acquire more and detailed data in a shorter time and enables real time access to geoinformation for a nearly unlimited number of users. Within the last years powerful tools for the storing and processing of geodata appeared on the market. However new systems are still not affordable for local governments and communities in many countries. Policies and strategies are necessary to make new information and communication technologies accessible to poor people too. Decentralisation and Community Empowerment require Spatial Information Experts at local level. The use of geoinformation resources requires knowledge at a local level about data acquisition, data processing, and the visualisation of data. The degree of geoinformation expertise is varying and depending on the responsibility of a specific person or user group. Decision-makers need another education and training programs in information technology than people involved in the implementation or maintenance of IT systems or specialists for data capture. Policy has to focus its activities on capacity building in the broad field of geoinformation technology. Sustainable development requires information exchange between different levels of public and private institutions. The use of clearly defined standards facilitates the sharing and exchange of geoinformation amongst various user groups. But the increasing number of collected and available geodata also requires a detailed description of the data, the so-called metadata. Metadata in the context of SDI facilitates access to data and can also prevent duplications that may arise from limited knowledge of available data residing at different locations. Implementation of spatial data infrastructure requires cooperation between the private and the public sector and amongst all professions involved in land management. Land registers and land cadastres as part of SDI mostly are the responsibility of public authorities. But decision-making processes demand additional thematic information about land collected and maintained by various public or private institutions or by professionals trained in a particular trade. Partnership and cooperation among all groups is necessary for successful geoinformation management. Spatial Information is an essential part of the infrastructure in a country. The acquisition and maintenance of geoinformation itself seldom is a cost-covering activity in a country. But the availability of geoinformation has positive impact on public as well as private business and welfare with consequences for the national economy. The creation of a countrywide SDI must be a primary objective at all levels of administration. Decentralisation and Community Empowerment require a specific geodata policy. As shown above various private or public users on different levels of administration require spatial information for decision-making – often based on the same geodata. The number of units involved with geodata management is increasing with the degree of decentralization. To avoid redundancies and inconsistencies in the collection, storage, maintenance and the distribution of geoinformation, policy has to provide the legal and the administrative framework as well as the business environment to clarify the responsibilities of various actors involved in geodata management. The regulations have to include detailed specifications in terms of the tasks for the units, in terms of the topics of data, and the defined working areas. Geodata policy also has to coordinate strategies for the integration of procedures within spatial information management. Alexander M. (2002): The Kondratiev Cycle: A generational interpretation. ISBN: 0595-21711-7, Published by iUniverse.com, 2002. Badhurst (1999): The Bathurst Declaration on Land Administration for Sustainable Development. Published by The International Federation of Surveyors (FIG). ISBN: 87-90907-01-9, Dec 1999, Frederiksberg, Denmark. Banko G., Mansberger R. (2001): Assessment of "Non-Monetary Values of Land" for Natural Resources Management Using Spatial Indicators. In: Njuguna, H., Ryttersgaard, J. (Eds. ): Proc., International Conference on Spatial Information for Sustainable Development, Nairobi, Kenya, 2-5 October 2001; FIG Commission 3, 310-322. Corbley, K.P. (2002): The GeoData Alliance: A New Hope. Reprint from GEOWorld July 2002., (2002). Dale P. (1999): Is technology a blessing or a curse in land administration?. UN-FIG Conference on Land Tenure and Cadastral Infrastructure for Sustainable Development, Melbourne, Australia, Oct. 1999. FIG PUBLICATION NO. 30: The Nairobi statement on spatial information for sustainable development. FIG in co-operation with the United Nations, ISBN: 87-90907-19-1 Frederiksberg, Denmark 2002. FIG PUBLICATION NO. 31: Land Information Management for Sustainable Development of Cities - Best Practice Guidelines in City-wide Land Information Management. FIG in co-operation with the UN-HABITAT, ISBN: 87-90907-21-3, Frederiksberg, Denmark 2002. Goodchild, et al. (1999): Introduction to the Varenius-Project, International Journal of Geographic Information Science, 13(8): 732-745, 1999. Mansberger, R. (2003): Geoinformation in Support of Decentralisation and Community Empowerment. Proceedings of the Third Meeting of the Committee on Development Information (CODI). United Nations, Economic and Social Council - Economic Commission for Africa. Document Nr. E/ECA/DISD/CODI.3/27. 10-16 May 2003. United Nations Conference Centre, Addis Ababa. Muggenhuber G. (2003): Geoinformation in optimized Business Processes. FIG Working Week, Paris, 2003. Murray, K. (2002): Bray, C.: Better connected: the three Ordnance Surveys improve georeferencing links. Proceeding of the AGI Conference at GIS 2001. United Kingdom 2001. Nefiodow L.A. (2001), Der sechste Kondratieff, ISBN: 3980514447, Oct.2001. Porter, M.(1998): Competitive Advantage: Creating and Sustaining Superior Performance. Free Press, 592 pages, ISBN: 0-684-84146-0 (1998). Thurston J. (2003): The New Geo-Jobs, a second look in the New Millenium. In: geoinformatics.com, Vol.6/2003, ISSN 13870858. World Bank (2002): Land Policies for Growth and Poverty Reduction, ISBN: 0-8213-5071-4, Washington 2002.